Okay, I'll admit it. I'm having a hard time here. It's this whole kids growing up thing and the looming inevitability of an empty house in less than six months. I know this sounds crazy from someone who should look forward to those quiet nights without having to worry where he or she is, or waiting to hear the car come into the driveway. After all we work hard to raise good, responsible, equipped children, so when they start showing signs that they're ready to leave, we should rejoice and push them gently out of the nest. Well, I'm not ready, just yet. Last night was yet another reminder that our time together under one roof is short. We attended Ben's Scholar/Athlete Banquet at Waukesha South High School to see him accept his award along with 260 other students. This award is given to any student who participated in at least one sport and maintained at least a 3.5 GPA for their first semester. Now I'm the proudest father around, that much is true. I always say I don't know what we did to get such a smart couple of kids - way more academically adept and engaged at that age than I was. So this event nearly brought me to tears on more than one occasion. Hearing some of the stories about kids overcoming adversity, or excelling in their upperclass years after joining a sport late, was nothing short of inspiring. 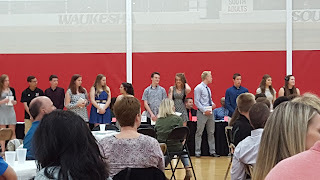 To see my kid up there with the top achievers both athletically and academically meant the world to me. 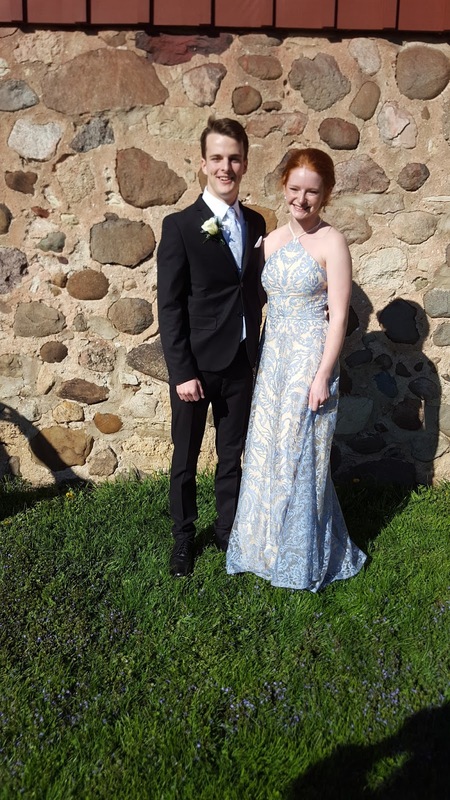 And then, last weekend we had to watch him prepare and set off for his last prom. We were reliving our own prom experiences in a conversation with some friends and were commenting about how nervous we remember being. Now, he was likely feeling the same. And while I think he was more than happy to have it come and go, I didn't want it to be the last prom I'd have to take pictures for for my kids. Part of me wants the little kids dancing in the living room at ages 2 and 5 again. I want trips to Frame Park where I push them on the swing. I miss watching Sarah screech and squeak her way through a 5th grade. I want to cheer Ben on at the soccer field again. I want picky eating, and tiny, little Velcro sneakers and cute little sweatshirts. As strange as it sounds part of me will miss the chaos of mornings where the bulk of the action is getting one or both of them up out of bed and off to school. I'll miss Christmas concerts and "Family Fun Nights at the grade school where we sugar them up with Pixie Sticks, play some games and hang out eating bad hot dogs in the sweaty gym with the music blaring. I know these feelings will probably pass, and may even do so much quicker than I think. But I think the only thing I can do is appreciate the days I have left with Ben hanging around. 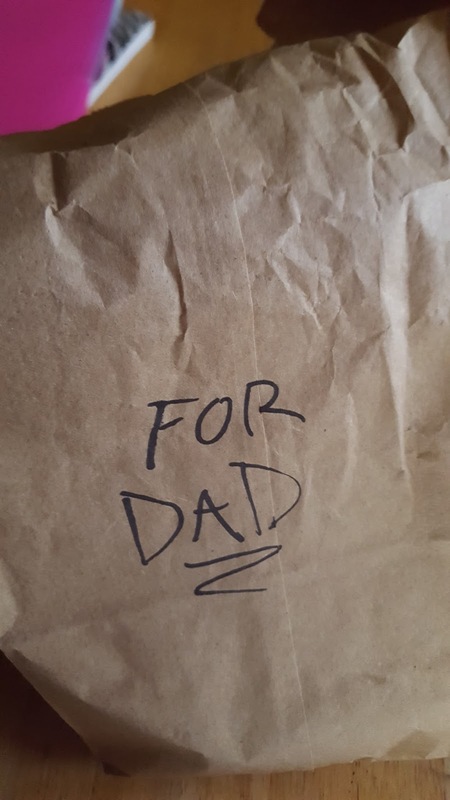 The other day, he left me a cinnamon crunch bagel in a bag from Panera where he works now. They give the bakery away at the end of the night and he was thoughtful enough to set one aside just for me. Now you might think it a strange thing for a 55 year old grown man to do, but I kinda got choked up. Part of the cause was knowing that this kind of thing is soon to stop as well. But it also means we did something right.